Haythornthwaite, Philip. 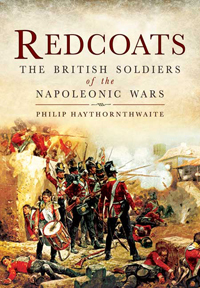 Redcoats: the British Soldiers of the Napoleonic Wars. Barnsley, UK: Pen & Sword, 2012. 206 p. ISBN# 9781844159581. Hardcover. $40/£20. At last count I have about 500 books dealing with some aspect of the British Army during the Napoleonic Wars. So when I picked up a copy of Redcoats my first reaction was why are they publishing another book on topic that has been so thoroughly covered already? So I approached reading it with less than an enthusiastic attitude. I am willing to admit when I make a mistake and in this case I did. Redcoats takes a different approach than other books on the British Army of the era. It focuses solely on the enlisted soldier and the only time an officer is mentioned it is in terms of his impact on the soldier at some particular time in the soldier’s life. Furthermore it covers all aspects of the soldier’s time in the military, from when he enlisted to his eventual discharge many years later. Redcoats logically starts at the recruitment of the soldier and looks at how a regiment would send out recruiting parties to find suitable men to fill their ranks. Mr. Haythornthwaite’s looks at the methods used by these parties to entice a man to take the King’s shilling and the reception they received in different areas of the country. He also explores the reason why a man would enlist and these reasons have not changed all that much in the past 200 years, for they range the gamut from patriotism to economic hardship to those looking for adventure, while others were just one step ahead of the law or an angry father. It is interesting to see how we have grown in the past 200 years. When I enlisted in the U.S. Army as an infantryman many years ago I was just under 6 foot tall and had a chest measurement of 42 inches. I was slightly taller than many of the other soldiers going through basic training with me, but my chest size was smaller than most. Redcoats also covers an area that is often overlooked in most books. That is the training of the soldier. It takes the reader through the time the new recruit arrives at the regimental depot until he sent on active service. Topics range from issuing of uniforms to drill to weapons training to garrison life. There are chapters on discipline – which covers a range of subjects such as a first hand description on what it was liked to be flogged to what it was like to serve in a firing squad – promotion, and soldiers’ families. The final three chapters cover active service. The first of these chapters deals with life on campaign. How a soldier lived when he was in the field – which most of the times was quite a bit different than the officers in his regiment. Living conditions often appeared to be either a feast or famine. When things were going the way they were supposed to, the British soldier’s life was probably no harder than what he experienced as a civilian. However as a campaign progressed and the friction of war took its toll, supplies became harder to obtain and the much daunted British discipline started to fray. It could be argued during the hard times that the British soldier was as rapacious as a French soldier when foraging. The author closes with a chapter on the life of the soldier after he was discharged. How many were released to return home and integrate themselves back into their former life. As with today’s soldiers, most were successful, but not all. Throughout the book, Mr. Haythornthwaite illustrates the points he is making with anecdotes from the memoirs and diaries the soldiers wrote. Some will be familiar to those who study the British Army, but many are from manuscripts in the author’s possession or from the long out-of-print United Service Journal. Redcoats is an engrossing book that moves along at a steady clip. It felt like I was sitting there listening to Mr. Haythornthwaite telling the story, rather than reading the words. It is reminiscence of John Elting’s Swords around a Throne. Both are full of information that leaves the reader wanting more. I highly recommend this to everyone interested in the Napoleonic Wars, even those who specialize in the British Army. Now I can only hope that someone will step up and tell the story of the French soldier! The sole exception is in Chapter Seven, where the author devotes seven pages to what life was like for those officers who were promoted from the ranks.